I’m not a cap & trade fan, but I find it rather bizarre that the most successful opposition to California’s AB32 legislation comes from the environmental justice (EJ) movement, on the grounds that cap & trade might make emissions go up in areas that are already disadvantaged, and that Air Resources failed to adequately consider alternatives like a carbon tax. I think carbon taxes did get short shrift in the AB32 design. Taxes were a second-place favorite among economists in the early days, but ultimately the MAC analysis focused on cap & trade, because it provided environmental certainty needed to meet legal targets (oops), but also because it was political suicide to say “tax” out loud at the time. While cap & trade has issues with dynamic stability, allocation wrangling and complexity, it’s hard to imagine any way that those drawbacks would change the fundamental relationship between the price signal’s effect on GHGs vs. criteria air pollutants. In fact, GHGs and other pollutant emissions are highly correlated, so it’s quite likely that cap & trade will have ancillary benefits from other pollutant reductions. To get specific, think of large point sources like refineries and power plants. For the EJ argument to make sense, you’d have to think that emitters would somehow meet their greenhouse compliance obligations by increasing their emissions of nastier things, or at least concentrating them all at a few facilities in disadvantaged areas. (An analogy might be removing catalytic converters from cars to increase efficiency.) But this can’t really happen, because the air quality permitting process is not superseded by the cap & trade system. In the long run, it’s also inconceivable that it could occur, because there’s no way you could meet compliance obligations for deep cuts by increasing emissions. A California with 80% cuts by 2050 isn’t going to have 18 refineries, and therefore it’s not going to emit as much. The ARB concludes as much in a supplement to the AB32 scoping plan, released yesterday. It considers alternatives to cap & trade. There’s some nifty stuff in the analysis, including a table of existing emissions taxes (page 89). It seems that to some extent ARB has tilted the playing field a bit by evaluating a dumb tax, i.e. one that doesn’t adapt its price level to meet environmental objectives without legislative intervention, and heightening leakage concerns that strike me as equally applicable to cap & trade. But they do raise legitimate legal concerns – a tax is not a legal option for ARB without a vote of the legislature, which would likely fail because it requires a supermajority, and tax-equivalent fees are a dubious proposition. If there’s no Plan B alternative to cap and trade, I wonder what the EJ opposition was after? Surely failure to address emissions is not compatible with a broad notion of justice. Author TomPosted on June 15, 2011 Categories Climate, PolicyTags AB32, California, cap & tradeLeave a comment on Et tu, EJ? [CARB chair] Nichols told venture capitalists and clean-energy executives last week in Mountain View, California, that she was “thinking of punting,” saying the specifics of the emissions-trading program may not be ready for 1-2 more years. My fear is that the analysis of GHG initiatives will ultimately prove overconstrained and underpowered, and that as a result implementation will ultimately crumble when called upon to make real changes (like California’s ambitious executive order targeting 2050 emissions 80% below 1990 levels). California’s electric power market restructuring debacle jumps to mind. I think underpowered analysis is partly a function of history. Other programs, like emissions markets for SOx, energy efficiency programs, and local regulation of criteria air pollutants have all worked OK in the past. However, these activities have all been marginal, in the sense that they affect only a small fraction of energy costs and a tinier fraction of GDP. Thus they had limited potential to create noticeable unwanted side effects that might lead to damaging economic ripple effects or the undoing of the policy. Given that, it was feasible to proceed by cautious experimentation. Greenhouse gas regulation, if it is to meet ambitious goals, will not be marginal; it will be pervasive and obvious. Analysis budgets of a few million dollars (much less in most regions) seem out of proportion with the multibillion $/year scale of the problem. One result of the omission of a true top-down design process is that there has been no serious comparison of proposed emissions trading schemes with carbon taxes, though there are many strong substantive arguments in favor of the latter. In California, for example, the CPUC Interim Opinion on Greenhouse Gas Regulatory Strategies states, ‘We did not seriously consider the carbon tax option in the course of this proceeding, due to the fact that, if such a policy were implemented, it would most likely be imposed on the economy as a whole by ARB.’ It’s hard for CARB to consider a tax, because legislation does not authorize it. It’s hard for legislators to enable a tax, because a supermajority is required and it’s generally considered poor form to say the word ‘tax’ out loud. Thus, for better or for worse, a major option is foreclosed at the outset. The BC tax demonstrates a huge advantage of a carbon tax over cap & trade: it can be implemented quickly. The tax was introduced in the Feb. 19 budget, and switched on July 1st. By contrast, the WCI and California cap & trade systems have been underway much longer, and still are no where near going live. 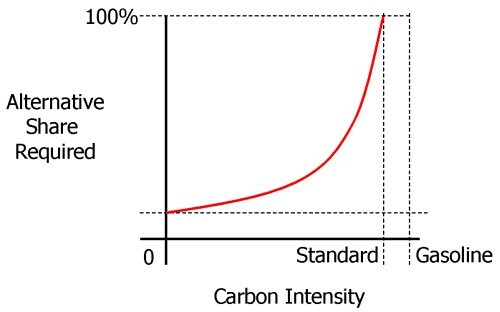 My preferred approach to GHG regulation would be, in a nutshell: (a) get a price on emissions ASAP, in as simple and stable a way as possible; if you can’t have a tax, design cap & trade to look like a tax (b) get other regions to harmonize (c) then do all that other stuff: removing institutional barriers to change, R&D, efficiency and renewable incentives, in roughly that order (c) dispense with portfolio standards and other mandates unless (a) through (c) aren’t doing the job.